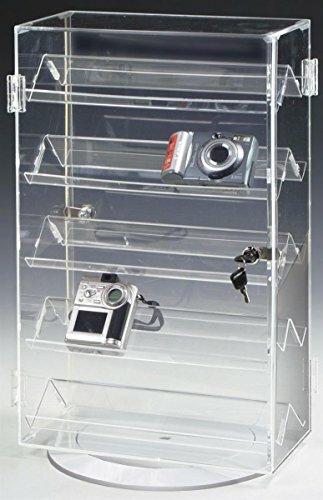 This retail countertop display case, or jewelry case, is crafted from frameless clear acrylic and will not distract the eye from viewing the items inside. There are 5 slanted, double-sided shelves where a variety of items can be displayed including jewelry, small electronics, etc. Two swing open doors allow for easy access to the items inside and each door has a cam lock to secure items inside. The whole display case rotates on a lazy Susan style base. Dimensions: 22"h x 13-1/4"w x 7"d. Five shelves are 4" apart. Weight: 11 lbs.